End of last month, Mamarazzi saw the author, Shamini Flint, posted up in Facebook that her newInspector Singh book would be out on April 5th, 2012. Surprisingly, Mamarazzi found the book while browsing at MPH on 4th April. What else...of course she grabbed the book. I got bored browsing at book store. I wanna go McD and have some fun. Hence, we bundled up and head on to Citta Mall. I had my "VANILLA cone Ice-cream". while Mamarazzi stuck her head in the book. Said it's very good. At the epilogue, she felt like crying. It was really moving. The story was past paced. As usual, Mamarazzi thinks the author had done a lot of research on the norm and culture in the country that she wrote about. She highlight issues like arranged marriage, religions differences and stuffs like that in this book. This round the book is a lot "spicier" with Mrs Singh also join in the fun of "investigating". 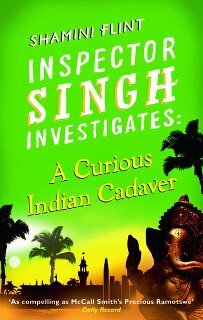 Mamarazzi is hoping that there will be more of Inspector Singh books to come. There are still many countries that Inspector Singh haven't "explore" yet. I don't mind the ice cream... LOL!!! wow, mamarazzi went to borong books still not enough?? wanna go MPH somemore ah?? hahaha, just kidding lah, i submitted mine already.. i am now waiting for them to refund my money!! oh, i heard of this book before, is this a series actually?? You really love reading! Thanks for the review! McD sundae i like it too! Kristy again...happy birthday! is it a joke book? like those Santa Singh type? A sundae could allow Mamarazzi to concenstrate in the book. Small Kuching is a good boy. Looks like a book that was touching. I tried to leave a comment on your blog yesterday but it keep showing Error 503. Its working fine today. No...not homour. It's serious. Suspense mystery type.